Money. You love to have it, and you love to hate it. But what is money? And why is it so important in our lives? Some incorrectly say that money is the root of all evil (the bible says the LOVE of money is that root). Before we talk about how to change our relationship to money, let’s look at what money is, how it is used, what has been used for money throughout history, and just why that is so important. You might even find some of this interesting! store of value. US Dollars have lost 96% of their value in the last 100 years—not much of a store of value! Bernard Lietaer defines money as “An agreement to use something as a medium of exchange”. There is a pattern of starting with a commodity, like cows or corn, or cigarettes in wartime or in prison. This commodity is then used as a medium of exchanging anything else. 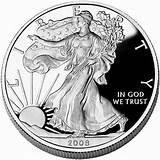 The US Constitution says that states shall not make anything but gold or silver to be used as money. Pure gold or silver have been accepted as having value for millennia, and the first minted or stamped coins were made of a mixture of gold and silver. Gold has retained its value for 2000 years, so that a one ounce gold coin which would buy a suit of clothes, shoes, a belt and a saddle in Roman times and 150 years ago will buy a good suit, shoes, belt and saddle today. But precious metals have a tendency to migrate towards wealth, and so a complementary currency to counter this effect is recommended. The next step in the development of money is using some other object as a representation of the commodity. 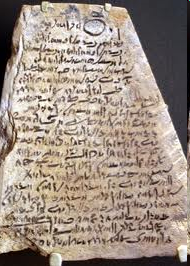 Examples are gold vault receipts, Ostraca (potshards) as receipts for wheat, or national treasury or bank certificates which can be exchanged for gold or silver. US Dollar silver or gold certificates were Representative money. All national money today is called fiat money, after the Latin word for “Let there be”, as in “Let there be light”, or fiat lux. Fiat money has no intrinsic value, and is backed by nothing. Its only value is that a government pronounced it as having value, and the government either has the trust of the people, or a big army to back up its mandate. Every fiat currency ever created has failed, reverting to its basic value of nothing, usually in a period of 40 years. The US Federal Reserve system was created in 1913. They shortly issued Federal Reserve Notes, our first Fiat Money. Then the Bretton Woods currency system was created in 1944, making the US Dollar the Fiat Money for the whole world, but since there were still US Treasury notes in circulation, the US Dollar could still be exchanged for gold or silver. Nixon took away the silver backing of the USD in 1971, making it a completely unbacked fiat currency. It has been 44 years now, and the USD is losing its position as the only world reserve currency. It appears to many that the US Federal Reserve Notes will fail in the near future, probably to be replaced by gold-backed US Treasury Notes once again. 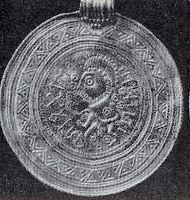 Metal coins were the first conventional type of money. They were standardized weights of precious metal, stamped with an image to mark them as having met a standard, so that they did not have to be constantly re-weighed in the market. Precious metal coins were the rule for centuries, but more recently, they have been replaced with base metals representing, but not containing, real value. 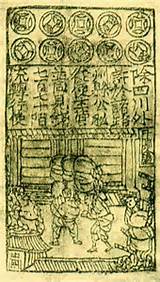 Paper money was first created by the Chinese in the Song dynasty, about 600 AD, and has since been used over the entire world. Paper notes were originally representative money (see above), acting as receipts for precious metals in storage. Later, much more of the “receipts” were issued than there was metal to back them, and today there is nothing in the vaults to back our notes at all! Still, this is what most people think of when they hear the word “money”. middle ages, around 1200. This period of time was known for its prosperity, health, freedom, and women’s rights. These all disappeared when the currency was debased, leading to loss of women’s rights, burning of witches, and the Black Plague within 50 years. 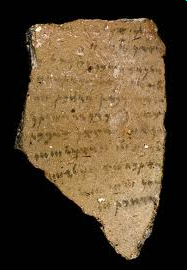 Ostraca were broken pieces of pottery, upon which were recorded receipts for warehouse storage of wheat in Dynastic Egypt. Again, this was a time known for prosperity, flourishing of the arts, and women’s rights. These collapsed after the use of gold coins was enforced by the Greeks and then Romans. Most money in the world today does not exist as gold, paper, coins, or anything recognizable. It exists only as electronic account entries in electronic banking ledgers. This is a further step away from physical money into the virtual idea of money. The latest development in money is cryptocurrency, best represented by Bitcoin. Bitcoin has no physical form, but it does represent work performed, in this case not human labor but complex computer calculations which create and secure the currency. Bitcoin and other cryptocurrencies can be securely stored, and transferred for almost no cost. They are opposed by central banks and governments because they remove control of wealth from the hands of the government and central banks. Improvements in cryptocurrencies allow the attachment of data, ideas, and agreements to cryptocurrencies for transmittal. Ownership and property can thus be sent as easily as the value of currency is transmitted. Early cryptocurrencies such as Bitcoin are good for speculating in currency, but not so good for stability of value. Over 4000 complementary currencies have been created to be used alongside or replace national currencies. Complementary currencies tend to increase the prosperity of the local community. Please read the short example of the bus tokens and garbage economy of Curitiba, Brazil, which increased the wealth of the people using it by 75%! the value of an hour of labor as the basic unit of money. The Ithaca Hour is the most famous of these currencies. like airline miles, the S&H Green Stamps given by grocery stores of the 1950s and 60s, Subway Sandwich loyalty cards, etc have been in use for at least 60 years. American Airlines has developed a rather extensive economy of air miles, which can be transferred from one person to another and used to purchase not only airfare and upgrades, but many other items as well. There are over 500 currencies used in Japan for the purpose of paying for elder care. There are scrip systems, electronic systems, mutual credit systems, and others. An interesting result of this is that the elders themselves prefer using the complementary currencies to pay for their care. They find that the care which they receive is more kind and loving than if their caregivers are paid in ordinary Japanese Yen. This is one more example of how the type of currency changes the behavior of those using it. 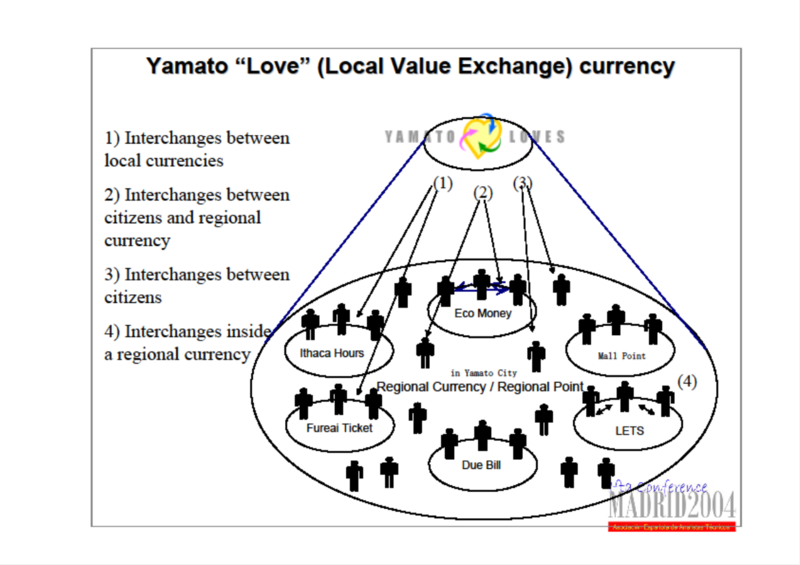 This figure shows a system of interchange of various complementary currency types in a region of Japan. The Swiss Franc (CHF) is known as one of the most stable of currencies. Recently (March 2015), the Swiss Franc was forced to separate from its connection to the Euro, because the Euro was losing value and the CHF was not. The CHF rose in value by 40% in one day when this peg was removed! Lietaer believes that one of the main reasons for the stability of the Franc is the existence of an obscure complementary currency known as the WIR. WIR means both “we” in German and Business Cycle (“Wirtschaftsring”). The WIR has no physical representation (no currency notes or coins). It exists only in the records of the Wir Bank, and has a value equal to that of the Franc (CHF). But WIR cannot be redeemed with CHF, but only by paying off loans which were made in WIR. 80% of Swiss businesses use the WIR to some degree, and there are 70,000 member businesses in the WIR Bank. Over 1.5 Billion WIR are exchanged annually, for about 2% of the total Swiss GDP. To read an example and learn how the WIR works, GO HERE. As we saw above, Money is an agreement to use something as a Medium of Exchange. Currency, then, is money that is circulating, or meant to circulate. to take them to market, but they are recognized as having value, even if they rest in someone’s garden, or at the bottom of the sea (as is the case in which one was being transported in a boat, which sunk!). But to be currency, the money must be portable! There can be more than one type of currency for a particular type of money. US Dollar is the money, and the dollar bill and the silver dollar coin are two of the many types of currency of this money. · So-called “Black Money” dollars for secure and clandestine transport of cash. · And even US Dollar coins minted and used in other countries along with the US dollar currency. What a complicated mess, right? How could anyone possibly use a system with twenty or so different kinds of dollars? Right? How could the people possibly use such a “complicated” system? And yet, Americans flow easily from one kind of dollar to another, without giving it a second thought! We see that it is possible to use different kinds of currency in a money system, using each type for a particular purpose. Our GEO currency system uses several types of currency as well. 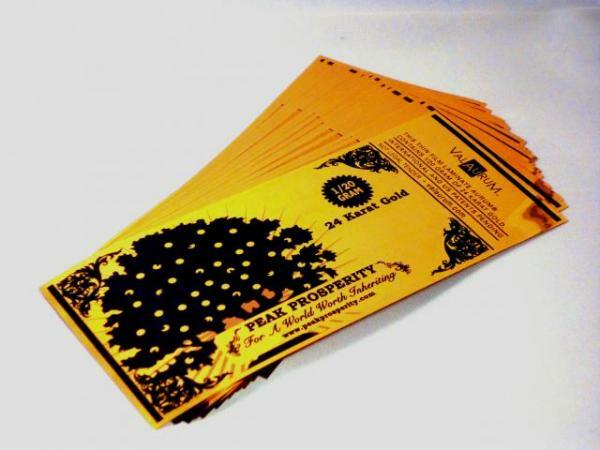 Aurum is a new currency type created by the Valaurum company. It uses a process of vacuum ion deposition to spray a uniform layer of precious metal atoms onto a polyester backing. This gold or silver layer is then covered with another polyester film, making a “note” similar in size and thickness to a regular US Federal Reserve Note. The Aurum comes in 1/10th and 1/20th gram amounts of pure gold. This gives the owner the ability to carry pure gold in a tradable form which is similar in size to other currency notes. 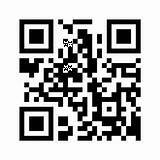 Aurum can have QR codes imprinted for further validation. We intend for our money system to include the possibility of local community currency systems authorizing artisans to produce beautiful pieces of art, which can then be traded and used as currency. We anticipate reproductions of local scenes or landmarks in the local currency notes, and hand painted or printed notes which have been accepted by the local currency board as a type of currency in their system. This currency will receive holographic seals and QR codes, again to support its validity. The local currency system may also choose to authorize the production of locally produced coins made out of wood or metal, shell, or other materials. These could also be given QR codes and hologram seals for validation. Abstract: Since 1934 the Swiss Wirtschaftsring (“Economic Circle”) or WIR Bank has issued its own reciprocal credits, not backed by Swiss Francs. Turnover in WIR+credits is shown to be highly counter-cyclical: firms are cash-short in a recession, and economize by greater use of WIR. A money in the production function (MIPF) model implies that this new spending arises mainly through increased credit Balances for larger firms, and increased credit Velocity for smaller ones. Panel data by industrial sector confirms this general pattern of WIR credits, a role similar to that of commercial trade credits, an important source of non+bank credit. The countercyclical multiplier on WIR expenditures will be highly leveraged.